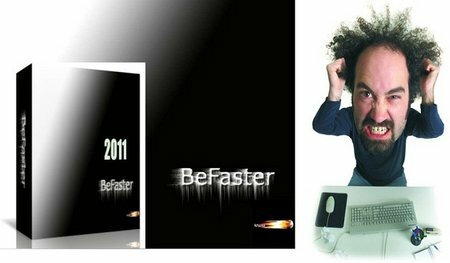 BeFaster is a multi-language internet speed up toolkit with some powerful tools. It makes optimization easier with better support and improved compability. It optimizes all kind of connection types: Dial-up modem, Lan, Wireless, Cable Modem, xDSL, ISDN, T1, DirecPc and Cable/DSL running PPPoE or PPPoA etc. and AOL, Symantec PcAnyWhere, IE, Opera. 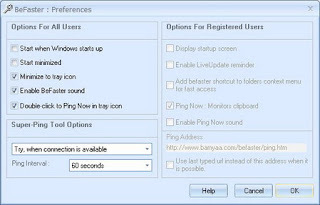 BeFaster will help you configure settings manually or program can automaticallyconfigure them for you. You can optimize your online/network gaming speed easily. 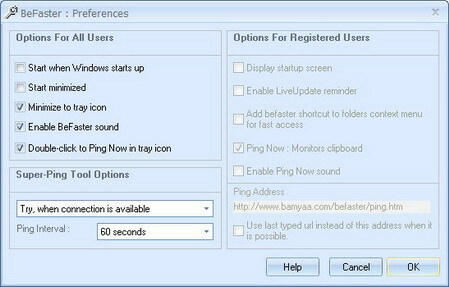 Its Super-Ping Tool prevents connection drops and its Ping Now Function awakes suspended modems. Easier and better with multi-language support (over 26 languages).